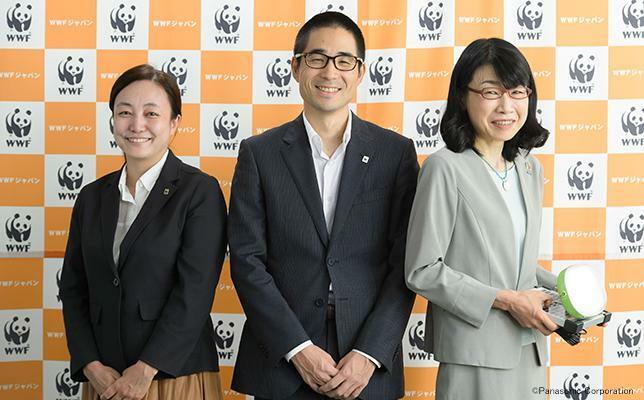 Tanaka: We've had the privilege of working with WWF on various occasions, including the Yellow Sea Ecoregion Project and reconstruction assistance for fish farming in Minami Sanriku. Oda: That's right. We'd like to thank you again for your cooperation in our Earth Hour event last year. Earth Hour is a global lights-off relay in which people around the world switch off their lights at 8:30 pm for one hour on the same day in late March to voice their hopes for conserving the global environment. Electricity used at our event was generated entirely by renewable energy and we were so grateful to be able to use the solar lanterns that run on the solar power. After the event, the lanterns were delivered to Sumatra in Indonesia to be used for our forest conservation project. Solar lanterns exhibited at Earth Hour. 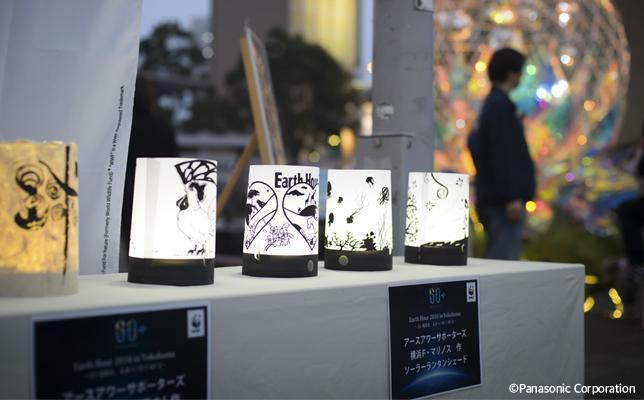 The lanterns were displayed together with lantern shades designed by calligrapher Soun Takeda and members of the Yokohama F. Marinos, a J-League professional football club, who were 2016 Earth Hour supporters. Tanaka: Can you tell us about the current conditions on Sumatra Island and the forest conservation project? Oda: Sumatra ranks high in biodiversity and is one of 35 priority places identified by WWF. However, its rate of deforestation is among the highest in the world, with forest area declining by 50% in the past 30 years. WWF is promoting a project to protect the local forests, and the solar lanterns are being used for ESD as a component of the project. The ESD program features an environmental education program created by WWF experts working with educators and introduced in three elementary schools. Students make crafts and recycled paper from waste materials, and compost from food waste. The class has been attended by approximately 430 students so far. 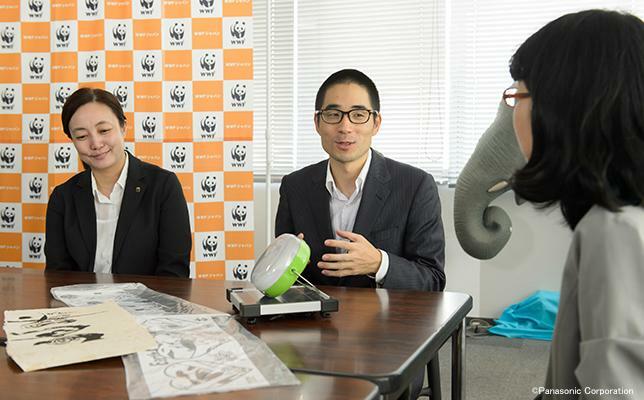 Kawae: There is also a class on renewable energy, and solar lanterns are used as one of the teaching materials. 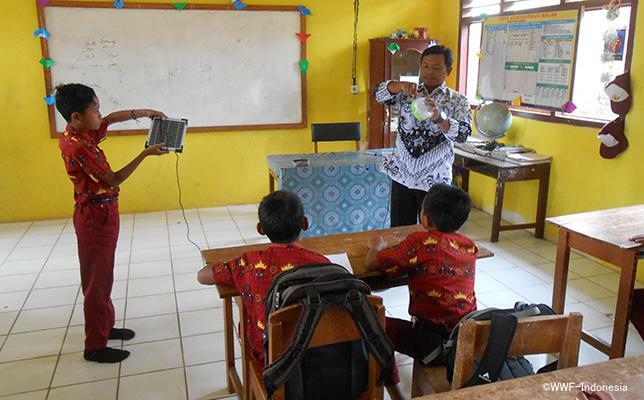 Not only do the children learn how electricity is generated by solar power, it also gives them an opportunity to learn about this light source that is safe and free. Solar lanterns are set up in classrooms and libraries, but they are also lent out to homes that have no access to public electricity to help people out in many ways. 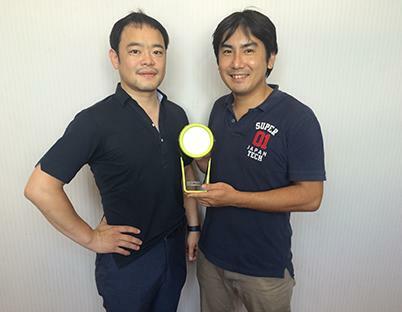 Tanaka: It's great to hear that solar lanterns are becoming a familiar part of children's lives. Panasonic is also dedicated to ESD and visits schools to teach about environmental education through product making. We hope there will be future opportunities for us to join WWF in environmental education in developing nations. 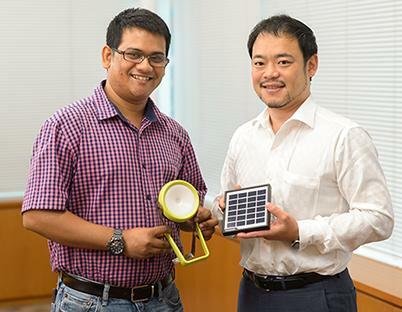 Kawae: Another way solar lanterns are being used is on night patrols by local residents. 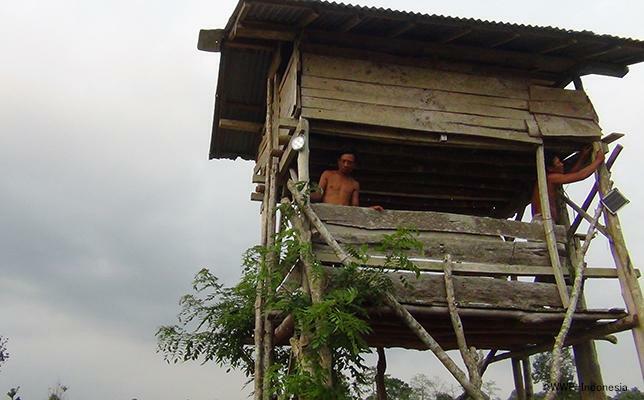 The forest conservation project is based in a village of several hundred households situated next to a national park. The villagers live by growing corn and other crops but deep forests lie right beyond those fields. The forests are home to Sumatran elephants, but they trample over the fields during harvest season. They come because they know they can find their favorite food there. The Sumatran elephant is an endangered species listed on the IUCN Red List of Threatened Species and must be protected. However, for the villagers, they are a pest that eats the food that supports their lives and at times, destroys homes and harms humans. Therefore, they sometimes kill the elephants even though they know it is illegal to do so. This led to the start of nighttime patrols with the support of WWF. A tower stands in the center of the field. There are 11 towers in the village, each with a solar lantern of its own. The lanterns have helped cut costs considerably in comparison to the battery-powered headlamps that they used until now. Tanaka: Did the residents understand when they were told that they should not kill Sumatran elephants? Kawae: It was difficult at first when the project launched in 2009. The rapid depletion of the forests deprived animals of their habitat, which brought them closer to human settlements. Meanwhile, nearby residents were the exact people who had cut down the forests illegally for the sake of their livelihoods. This ultimately brought animals closer to humans and increased conflicts. With this situation in mind, WWF has worked to create a safe environment for elephants and humans to coexist. We don't just tell the residents not to kill the elephants. We also show that we understand the value of their crops and teach them methods to drive the elephants away with as little impact on the surrounding environment as possible, like using fireworks to create noise, or mixing crushed chili into elephant dung and burning it to create an irritant odor. We've also provided guidance on how to grow organic cacao that can be sold at higher prices, and connected the locals with high-end chocolate manufacturers as a part of sales support. Through extensive conversations and relationship building, we've grown into partners that protect the Sumatran elephant and forest together. Tanaka: That is amazing. I'm sure you faced many challenges to get to this point. The nighttime patrol must require immense effort as well. Kawae: In addition to the elephants' favorite of corn, we also patrol the rice, cacao, and banana fields every night during harvest seasons, which happen several times a year. We must stay alert since elephants come almost every night. When I accompanied the patrols before, I could see that the solar lanterns help out all night until sunrise. A neighboring village that learned about the drop in damage from elephants has also started nighttime patrols. We'd like to try expanding this circle in the future. View from the tower. In the background is a freshly harvested corn field. 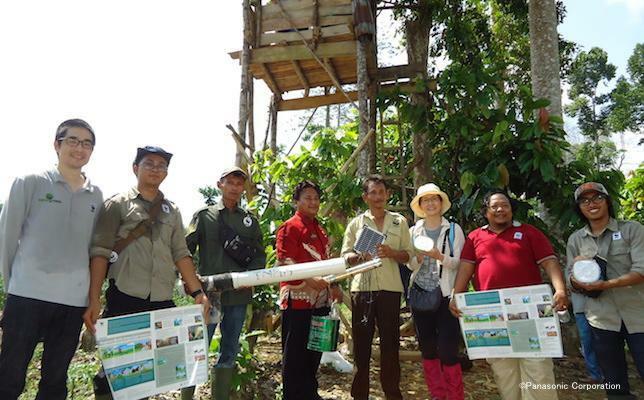 Oda: Our project on Sumatra is dedicated to protecting life on land (Goal 15), but our close cooperation with locals is an action truly based on partnership (Goal 17.) 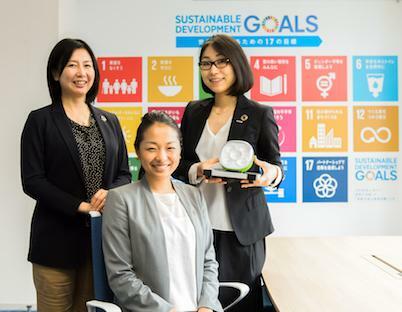 The solar lanterns have so much potential for contributing to different SDGs. 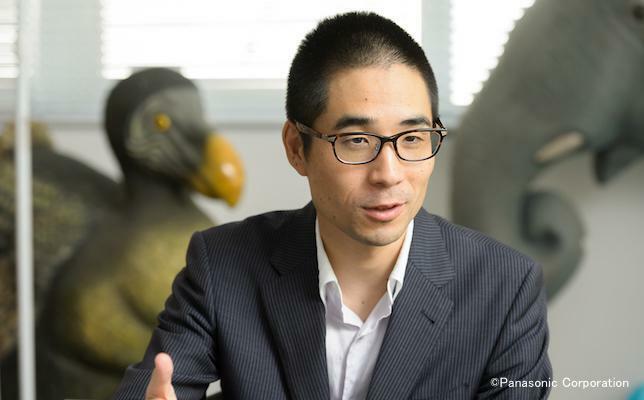 Kawae: Many of the endangered species are impacted by climate change, which means that addressing climate change is a must for their protection. 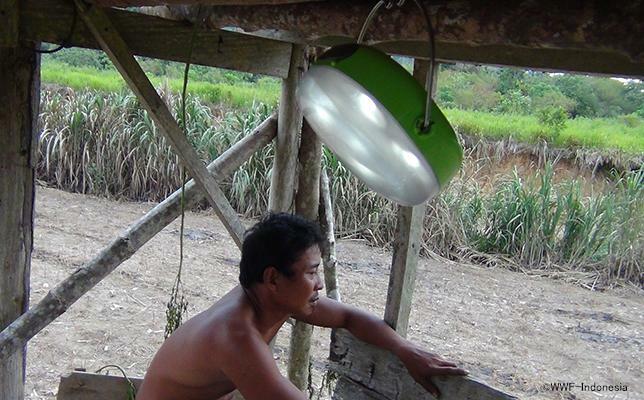 WWF works in various areas without electricity, so tools like solar lanterns are really a necessity. We hope to continue delivering light to people in high-need areas together with Panasonic. Tanaka: The feeling is mutual. There are still many more people in the world in need of light. The 100 Thousand Solar Lanterns Project will end in 2018, but our actions to "deliver light" will continue in future projects, and we look forward to contributing as a corporate citizen in achieving the SDGs. Having light will enable children to study and help them grow into people who contribute to society, and that talent will bring positive influence to the world. We hope to continue our support through light that will trigger social change. In October 2017, Panasonic employees visited the forest conservation project at Bukit Barisan Selatan National Park together with Shinichi Kawae and Tomoko Oda. They saw solar lanterns being used during nighttime patrols and heard words of gratitude from local residents.